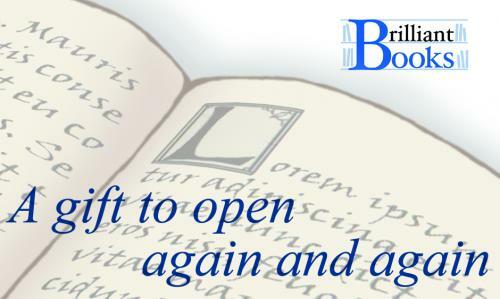 Giving Brilliant Books eGift cards is simple. Choose any amount, let us know what email address to send it to, and, if you like, add a personal message to the recipient. Your work is done! Your gift arrives in the recipient's email inbox as soon as your order is processed; we'll also send you an email to let you know it's arrived. eGift Cards can be used to buy brilliant books and bookish gear through our website 24 hours a day. For in-store shoppers, try our Gift Certificates! Be sure to include your name so the recipient knows who the gift is from! Would you like this eGift card delivered on a specific date? (MM/DD/YYYY) Please note that for weekend delivery, eGift Cards must be purchased by Friday at noon. If no date is listed, the eGift Card will be sent as soon as possible.